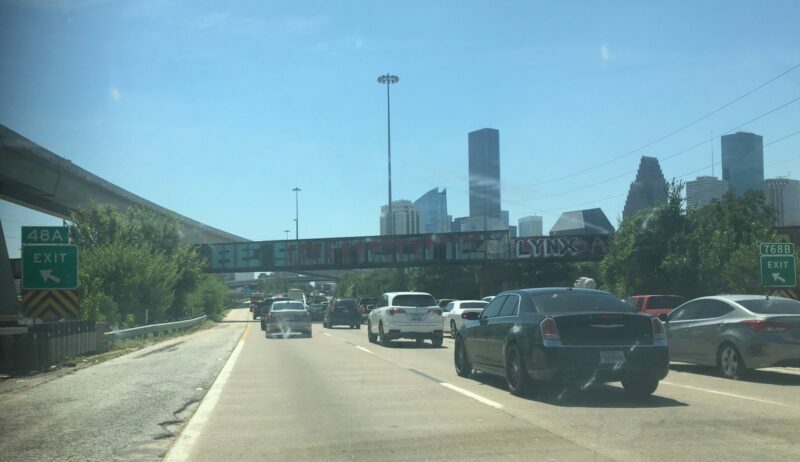 The iconic “Be Someone” graffiti just two weeks after Hurricane Harvey flooded this road. One year ago this weekend, I was sitting in my apartment in Huntsville, Texas, watching the angry red and yellow splotches sweep southeast Texas. An aerial view of Hurricane Harvey on the coast of Texas in August 2017. Thirty minutes south, my coworkers hunkered down in the office, still trying to do their jobs despite the pouring rain and whipping winds. Two hours south, my mom and dad rode out the storm in my childhood home with our pets, just like Ike in 2008, and Rita in 2005. And here was me, getting ready to drive into it so the public could stay informed and safe, well as safe as they could be given what was happening. On August 25, 2017, Hurricane Harvey made landfall on San Jose Island as a Category 4 hurricane, then stayed like an unwelcome guest, dumping unprecedented torrential rains over Texas and causing $125 billion in damage in Houston and surrounding areas. Many homes were flooded, sending thousands in the city into shelters like the George R Brown Convention Center and the NRG Center, where they would stay for days, unsure of the state of their home and belongings but fearing the worst. Beloved Houston landmarks took on feet of water, including the Theatre District downtown. The historic Alley Theatre, which had just completed a full renovation in 2015, lost their Neuhaus Theatre and prop storage to 17 feet of water. According to the Houston Business Journal, these had been flooded in Tropical Storm Allison and these concerns were taken into consideration during the renovation, but Harvey’s levels surpassed Allison’s. Below is a video made by the Alley showing the devastation to their facilities following Harvey. In my hometown area, the floodwaters destroyed Kingwood High School, forcing the school to close for the rest of the 2017-18 school year (which had just barely started) and the students to share nearby Summer Creek High School. Large swathes of Kingwood and Humble were underwater, including many locally-owned and operated businesses which are still slowly rebuilding even a year later. 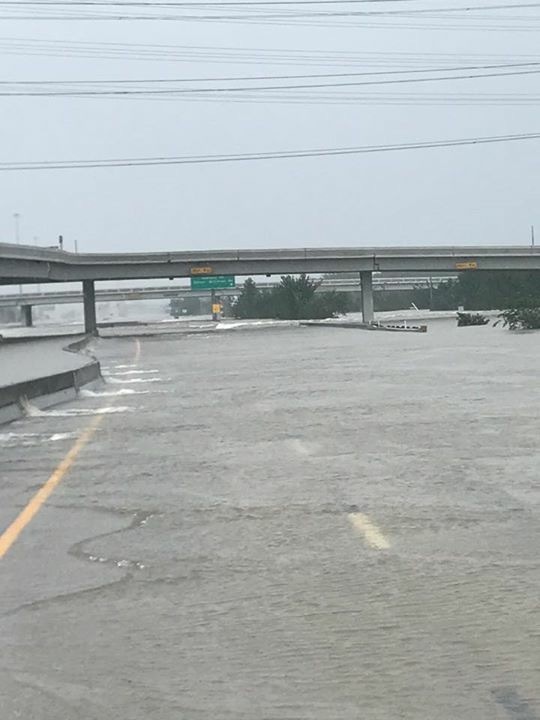 US 59/69, a main thoroughfare through town, was impassable, with the rushing floodwaters actually picking up concrete barricades and washing them down the road like leaves on a stream. The FM 1960/59 area was basically a lake from all the water, businesses and hotels and homes flooded. Below is drone footage of the area by Deerbrook Mall, taken just a couple days after the rain stopped. Down on the coast, cities like Rockport in Aransas County felt the first punches of Harvey, buildings and homes crumbling under the winds and rain. A year later, people are still unable to go home, and are unable to afford to rebuild. North in Montgomery County, the water swelled into Lake Conroe, forcing a dam release which sent feet of water rolling into homes around the lake and San Jacinto River, only doubling down on the damage already caused by the storm itself. Small towns like Woodloch, with only a population of around 250 people, were devastated, their infrastructure heavily damaged. The days and weeks that followed Harvey were full of heartbreak, confusion and resilience as people struggled to get back to their homes and businesses still blocked by water and debris. In Rockport, they made a temporary courthouse out of an old hardware store in a month and a half, as the old one was decimated to a “pile of rubble and a slab of concrete.” In Woodloch, the mayor operated the town out of her own gutted home. In Conroe and Kingwood, restaurant owners, despite the damage to their businesses, opened their doors to feed first responders and help support staff now out of work. Quite a few of my friends would spend the next few months living out of hotels and couch surfing while their homes and apartments were gutted and rebuilt, the water soaking everything down to the studs in the walls. So hopefully you realize how much impact even a small amount of help can give in the face of such devastation. Before the storm was over, many organizations and especially the SPN Family was in gear, doing whatever they could think of to help, donating funds and items, helping with the rescue effort, organizing auctions and donation drives, checking in on those in the path of the storm and passing along much needed information to those worried about their loved ones. The SPN Family also rallied behind the Stronger than Storms CrowdRise campaign, which to date has raised over $470K for national and Texas organizations helping residents with much needed necessities like diapers and pet care and providing assistance to low-income, uninsured or underinsured individuals and families. Watching all of this unfold on social media brought me to tears, and still does, even twelve months later. The fandom that stepped up to help my city and my home get back on the road to recovery post-Harvey is the fandom I fell in love with, a fandom of kindness and love for their fellow humankind. This is the SPN Family I know and love, the one I’m proud to be a part of. If you were part of the rescue and recovery effort following Hurricane Harvey, let me personally say thank you. Thank you for all that you did for the people of Houston and the surrounding towns and cities. Thank you for donating. Thank you for organizing. Thank you for sharing. Thank you for everything. Even if you don’t think you did anything beyond donating a few dollars or retweeting a link, you did. You gave hope where there was loss. You gave love where there was pain. You gave consolation where there was suffering. And not just for Houston, but for Florida and Puerto Rico in the following months. Because that’s what we do best. We save people. We accomplish things. So on behalf of a grateful city and state, thank you. ‘Finding Dory’ Coming to Blu-Ray on November 15!